A new support article from Apple details the True Tone features of the new MacBook Pro. Surprisingly (to me, at least) you can enable TrueTone on the late, lamented Apple Thunderbolt Display from 2011 (well, if you have a Thunderbolt 3 to Thunderbolt 2 adapter that is), as well as the LG UltraFine 5K Display and LG UltraFine 4K Display. The LG displays are the ones Apple promotes for use with its laptops. However, the company says it’s planning a new display of its own. It probably won’t arrive until 2019 alongside the promised, revamped Mac Pro. True Tone automatically changes the White Point and color balance of the display based on real-time measurements of the ambient light falling on the screen. 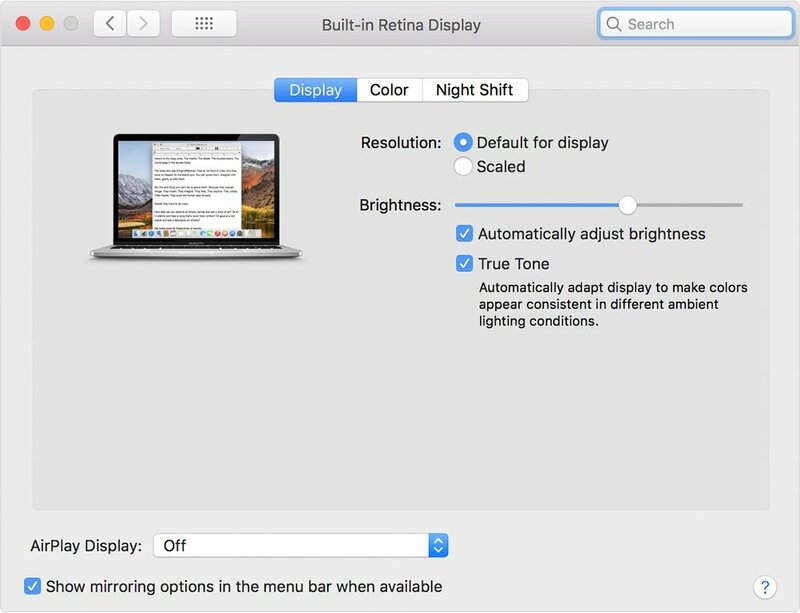 The True Tone technology in the new MacBook Pro uses advanced multichannel sensors to adjust the color and intensity of your display and Touch Bar to match the ambient light so that images appear more natural.